DISCOVERY Take a Jewish Heritage tour in the city with the most populous and active Jewish community in central Europe. With a free day to explore before your cruise, take time to take photographs on the Royal Palace grounds in this treasure trove of historical architecture. Try Budapest’s famous thermal bath spas, then lunch in a garden or rooftop eatery before boarding your Suite Ship®. DISCOVERY Enjoy an onboard lecture about the Jewish communities and life in Eastern Europe. DISCOVERY Take a tour about the Jewish history of Vienna, which goes back over 800 years. Later, relax on board with live Klezmer entertainment - a musical tradition of the Jews of Eastern Europe - as you sail to Dürnstein. ACTIVE Join a Hike up to the castle ruins with your Adventure Host for a spectacular view of the village, Danube, and the Wachau Valley below. CLASSIC Take a Guided Tour of Melk’s magnificent Benedictine Abbey to marvel at its frescoed ceilings, statues, incredible library, and ornate pipe organ. DISCOVERY Enjoy the flavors of the Wachau Valley with a Wine Tasting on board. Join a full day Guided Optional Excursion to Salzburg—the city of Mozart—or a full day Guided Optional Excursion to the picturesque Bohemian town of Cesky Krumlov. Meet your ship back in Passau after your selected activities for sailing. DISCOVERY Join a Guided City Walk and see Altes Rathaus (Old Town Hall) and Porta Pretoria—built in 179 AD as the entrance to Castra Regina fortress. Follow the traces of the oldest Jewish community in Southern Germany. DISCOVERY Later, indulge in a Beer Tasting on board. 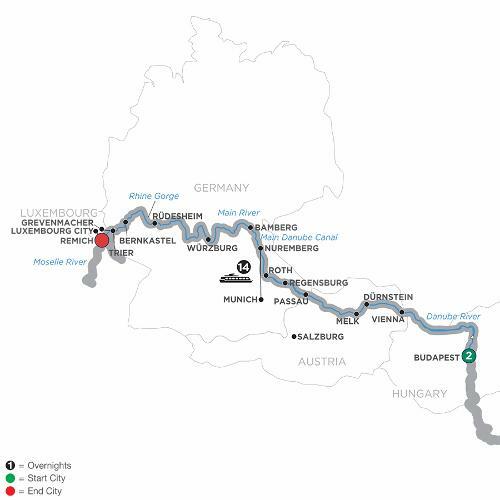 DISCOVERY Enjoy an Onboard Lecture about the Main-Danube Canal—linking these two rivers to make a vital connection enabling navigation between the North and Black Seas. CLASSIC Take a Guided Tour of the historic Nuremberg Rally Grounds—used by the Third Reich. CLASSIC Take a full-day Guided Tour of the highlights of fascinating Munich. See Nymphenburg Palace—a former residence of German monarchs, along with the old and new Town Halls of Marienplatz. CLASSIC Take a Guided Walking Tour of the former home to imperial dynasties, and see its Romanesque cathedral, Old Town Hall, and seven hills crowned with churches. This evening, enjoy onboard entertainment. CLASSIC Take a Guided Sightseeing Tour of the “Pearl of the Romantic Road” with its Old Main Bridge, towering fortress, and baroque Bishop’s Residenz—with the largest known ceiling fresco. Explore the city on your own or visit a local winery. Later, enjoy onboard entertainment. CLASSIC Join a Guided Walking Tour of a picturesque Bavarian village. Cruise through the magnificent Rhine Gorge. Spend some free time at your leisure this afternoon—with a hike to view the vast vineyard landscapes, a bike ride through the Renaissance-style village, or relax with a glass of regional wine. DISCOVERY Join a Wine Tasting to experience the tradition of legendary German wine making. CLASSIC Join a history-focused Roman Trier Guided Tour to learn more about the history of Roman civilization in this Moselle River city, and visit the ruins of a 20,000-seat amphitheater, and imperial baths. This afternoon, take a Guided Optional Excursion to Luxembourg City—with its dramatic views, ancient ruins, and modern architecture in its deep gorge terrain. This evening cruise to Remich. On this European river cruise vacation, you’ll sail along the Danube, Main, Rhine, and Moselle Rivers. Start with two nights in vibrant Budapest, Hungary, and then see some of the most intriguing cities of Austria and Germany. On the first portion of your cruise, from Budapest to Nuremberg, also discover the European Jewish Heritage through dedicated sightseeing in Budapest, Vienna and Regensburg, and an onboard lecture about Jewish culture and history. Before you embark on your European river cruise, experience the unique energy of Budapest, the capital of Hungary, on a guided tour of the city and time to explore on your own. Sail past the impressive Parliament Building on the Danube River, to Austria’s elegant capital of Vienna. There’s a guided walk in the quaint village of Dürnstein, in the heart of the Wachau Valley, and a visit to the magnificent Benedictine Abbey of Melk. You’ll be introduced to the treasures of Passau, Regensburg, and Nuremberg, and take an excursion to Bavaria’s capital, Munich. On the banks of the Main River, you’ll find small towns tucked away behind defensive walls and towered gates. Along the Rhine River, stop in Rüdesheim, a quintessential Rhine Valley town. Later, cruise the wide, peaceful curves of the Moselle River Valley, famous for its picturesque scenery, and arrive in the wine village of Bernkastel. Before you leave, we’ll introduce you to some of the famed Moselle wines. In Trier, Germany, believed to be even older than Rome a Local Guide will show you the sights, including the Porta Nigra, the only surviving fortified gate from the original Roman settlement. Disembark in Remich, Luxembourg to end this exciting river cruise vacation through Europe! During the first part of the cruise Eva Schloss, stepsister of Anne Frank, will travel with you. Enjoy her lectures on board! Gateway city for departures is Luxembourg.